Crownstone, founded in 2016, is a company that combines indoor localization with building automation for homes and offices. Crownstone went through the Rockstart (http://rockstart.com) accelerator (demo day July 2016). We acquired a large network of business contacts, have a scrutinized business model and it ranks our company as a potentially disruptive and scalable player. Crownstone has support from Almende as research company and from Almende Investments as investor. This guarantees that Crownstone can produce beyond state-of-the-art technology and has enough budget to grow organically. Crownstone’s unique selling point is indoor localization. This has not been capitalized upon by any competitor in the home automation market, and only a few in the building automation market. There are already many people who have bought Crownstones. The Crownstones can be ordered at https://shop.crownstone.rocks. The Crownstone smart plugs and connectors save energy automatically when there are no people present and act according to the personal preference of people when individuals are present. “Crownstone Plugs für Indoor Localization und Building Automation”, 2018, Home & Smart. “Indoor localization with the Internet of Things”, 2017, shared press release together with EnOcean. 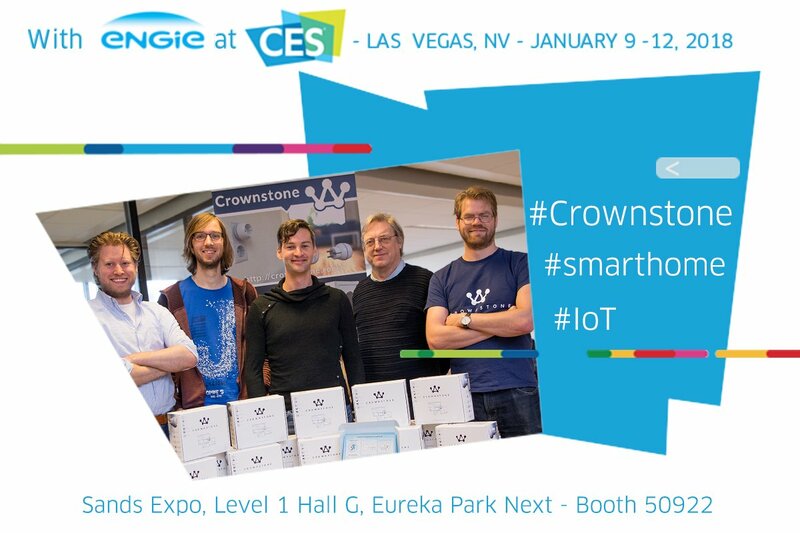 “Crownstone takes home automation beyond Alexa”, Cate Lawrence, 2016, readwrite.com. “Crownstone, the Smart Power Outlet that Uses Indoor Location”, Ludovic Privat, 2015, gpsbusinessnews. “Slim, heel slim, dit stopcontact”, 2016, innovatief.be. “Smart stuff”, Bruce Byfield, 2015, linux-magazine.com. “Als een smart plug niet smart genoeg is, dan ontwerpen we er zelf maar een”, 2017, FWD Magazine. “Nederlandse start-up introduceert module om stopcontacten slim te maken”, Olaf van Miltenburg, 2015, Tweakers. “Rotterdammers lanceren ‘slim’ stopcontact Crownstone”, 2015, nu.nl. “Slimmer huis dankzij een stekker”, Samira Himmit, 2016, NRC. “Smart Industry in de praktijk: DoBots lanceert slim stopcontact op Kickstarter”, 2015, smartindustry.nl. “Crownstone: slim stopcontact maakt van jouw huis een smart home”, Sophie de Kok, 2015, dutchcowboys.nl. “Crownstone: met dit slimme stopcontact kun je energie besparen in huis”, 2015 businessinsider.nl. “Crownstone: een simpele oplossing voor een slimmer huis”, 2015 fme. “Deze ondernemer ontdekte het grote verschil tussen Kickstarter en Indiegogo”, Maarten Keswiel, 2015, sprout.nl. “Nederlandse Dobots Kickstart Crownstone: iBeacons in je stopcontact”, Remco Bron, 2015, ibeacon-nieuws.nl. “Crownstone: Nederlanders maken slim stopcontact dat je moet hebben”, Milton Broen, 2015, want.nl. Demo on Crownstone turning off dangerous devices, 2016, Youtube. Demo on Crownstone hardware features, 2015, Youtube. Crownstone pitch at EcoSummit 2016, Youtube. Second place in GetInTheRing contest at Mediamarkt, 2016, article. “Ontleed het brein van een smarthome” / “Dissect the brain of a smart home”, Tweakers Smart Home event, 2017, Youtube. “Open source power outlets”, 2015, Linux Unplugged. Use a black logo on a white background, especially on products or material that does not benefit from color. Logo is white on blue in the case where the logo really needs to pop out. Use bands over the full width, do not use a circle around the logo. Do not use too many colors in supporting photographs and search for consistency with the brand colors. The brand colors are a shade of blue (#003e52) and the complementary shade of orange (#ff8400). Use the orange shade as an accent, e.g. for line separation, emphasis, not as a primary color. Use Lato medium as a font. Use the blue font on summaries or accentuated text. Use just a black font wherever possible for the primary text. In case ligher shades of colors are required. Go to the Adobe color wheel. Click on “HSB” and adjust the second row. This will only adjust the saturation of a color, not the hue. If you need a slide deck for a particular customer, feel free to contact us for your particular needs. Icons: for dimming, switching, positioning, etc. Products: pictures of Crownstone plugs, builtin Crownstones, Guidestones, and PCBs. Renders: exploded views and renderings in living room setting. It can be downloaded here: presskit visuals (zip, 342 MB). The logos (zip) can be downloaded separately. At Crownstone we organize a Smart Home & Bluetooth Hackerspace meetup. The topic is slightly different each time, mostly concentrating on integrating other technology within the Crownstone positioning system. Q. Do I need to be close to a Crownstone to control it? A. If you have multiple Crownstones they form a mesh network. If there is one Crownstone in your proximity they can forward the information to the entire network. It is also possible to control the Crownstone from online by leaving a smartphone or tablet at home. Q. How accurate does a Crownstone measure my position? A. 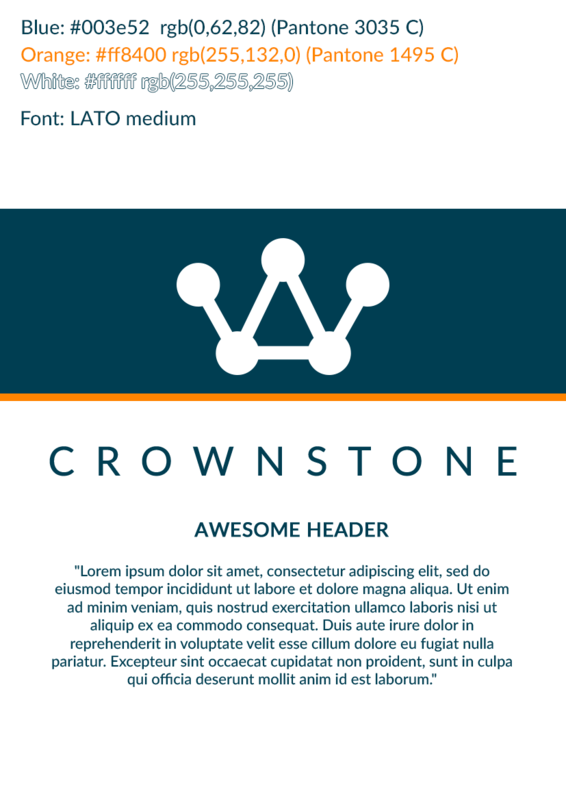 A single Crownstone has an accuracy up to three to eight meters, just like an iBeacon. By using multiple Crownstones, the location becomes more accurate. If also the sensors on the smartphone itself are used, submeter accuracy is feasible. Our current software aims for room-level accuracy (around 1.5 meter or 5 feet). Q. What devices does the Crownstone recognize? A. The Crownstone measures both voltage and current. This allows it to measure not only power consumption, but also the type of load. Motors and transformers are reactive. Lights and heaters are resistive. The Crownstone also measures the current at a high frequency. This type of data characterizes a device. The types of devices the Crownstone can distinguish are lamps, fridges, electrical kettles, smartphones, and laptops, for example. Q. What is the protocol used by the Crownstone? A. The Crownstone uses Bluetooth Low Energy. This technology is directly available on a contemporary smartphone. The Crownstones can directly be controlled from your smartphone without the need for a hub. Moreover, the location of your smartphone can be used to turn off devices when you leave a room or turn on the lights when you enter a room.